This camera can capture clear images with IR function even in darkness. IR-III Dot Infrared Lights,long visible distance,lighting evenly,long life-span. 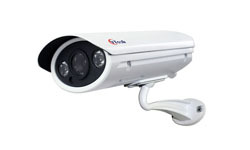 with external IR LED,lens is separate with IR,totally solve flash,reflecting and whitening ,etc.problems. It meets the standard of IP66 anti-water,anti-dust,adaptable to any environment. Adopting the newest 2.0megapxiels IMX322 HD CMOS sensor which presented by Japanese Sony, and High-performance processor NVP2441H ISP which purely compressed by hardware. The number of PCB board’s layer will influence the electrical performance directly,more layers of PCB board,the larger area of wiring,more uniformly of placing wires.Signal insulation will be better.Interference between the signals will be less and product performance will be more stable. The bonding pad adopts the Immersion Au Process,components contact well and low loss,the signal transmitted through the copper layer will not be affected,and also with good heat dissipation and electrical performance. The world's latest IR-III dot infrared technology,Single integrated light source instead of the stars traditional LED light source.It’s totally solve the first generation of LED and second generation of array LED disadvantage of fast lumens depreciation,poor heat dissipation,short life time and insufficient brightness,with the advantage of long visible distance,lighting evenly,long life-span,small size.Life is five times that of the conventional LED,two years Light fades ≤10%. IR-CUT switch consists of IR cut-off filter and all spectral through filter..When the IR cut-off filter on, it can block infrared wavelengths which affect the imaged badly at the light sufficient day time, above 95% 700nm infrared can be cut-off, then the CCD can produce accurate color images, get more pure and softer picture, finally make consistent with human vision.At night, the IR cut-off filter will auto switch to spectral through filter while the light insufficient, then CCD make full use of visible light to improve performance of low illumination, reduce the noise, clarify the image. Inferior video cable uses a kind of thin and impurity containing copper core ,and the protective coating can be inflammable easily,which will affect the signal transmission and electricity utilization seriously; however,professional vedio cable adopts pure thicker copper core,with the flame-retardanting of protective coating ,it makes sure the vedio transmission more stable and electrical utilization more safe. It is a function which reverses the area about strong light,To light balance. The Wide Dynamic Range (WDR) is a function that it can acquire natural images with fewer blown out highlights and blocked up shadows by combining a multiple number of images,shot at different exposure times,using digital signal processing. Exposure Control for IR Light can reduce the over-exposure of IR center area,making the whole image gentler. This camera is equipped with infrared lights,It will automatically open infrared light to compensate ambient light in low-light environment,It applies to poor-light or any dark environment,displaying clear images in the dark.Reaching the IP66 waterproof rating,it's applicable to a variety of open spaces.